NASA's Voyager 2 probe captured this image of Neptune five days before its historic flyby of the planet on Aug. 25, 1989. A quarter-century ago, the world got its first good look at the solar system's other blue planet. NASA's Voyager 2 spacecraft made the first-ever flyby of Neptune on Aug. 25, 1989, zipping by the "ice giant" and its frigid moon Triton in quick succession. The historic encounter gave a face to two worlds that until that time had dwelt in depth and shadow, mission team members said Monday (Aug. 25) during a NASA event commemorating the flyby's 25th anniversary. The encounter revealed a storm the size of Earth swirling on Neptune, as well as winds topping 1,000 mph (1,600 km/h) — the fastest ever measured in the solar system. 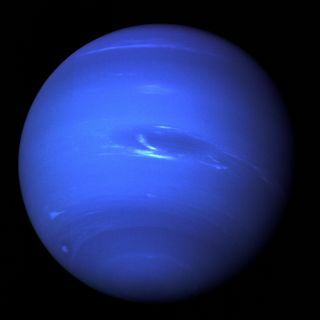 Such observations came as a surprise to mission scientists, because solar energy tends to drive atmospheric activity and Neptune lies so far from the sun. Members of the Voyager science team look at new images of Neptune's moon Triton as information from NASA's Voyager 2 probe comes down to Earth in August 1989. Voyager 2's images of Triton also caused jaws to drop, showing incredibly complex terrain and active geysers blasting material into space. In fact, the Triton encounter remains a highlight for Voyager project scientist Ed Stone, who has overseen the science operations of the mission since its inception in the early 1970s. "The Triton flyby was my favorite moment partly because it was a bookend. The journey really started with the discovery of volcanoes on [Jupiter's moon] Io with Voyager 1, 10 years earlier — the first bookend," Stone, who's based at the California Institute of Technology in Pasadena, said in a NASA statement. "We finished the planetary part of the mission with another bookend, the flyby of Triton, where we discovered a much colder, smaller world that was also geologically active." Voyager 2 launched in August 1977, a few weeks before its twin, Voyager 1. Together, the two probes pulled off an unprecedented "grand tour" of the solar system's big planets, flying by Jupiter, Saturn, Uranus and, finally, Neptune. NASA transformed its JPL television studio into Neptune mission control for the final flyby, with legendary singer Chuck Berry performing in a special concert at the center to commemorate the event. For the Voyager 2 flyby of Neptune on Aug. 25, 1989, NASA transformed its television studio at the Jet Propulsion Laboratory into Neptune central, with a detailed set and video displays to share the latest images and data from the spacecraft. But after Neptune, the two Voyager spacecraft weren't finished. They kept right on flying, during an extended phase known as the Voyager Interstellar Mission. Voyager 1 entered interstellar space in August 2012, and Voyager 2, which took a different path through the solar system, should make it there soon as well. Both spacecraft are still going strong today. As the two Voyagers streaked through space, lifting the veil on world after world, mission scientists marked off big milestones in their own lives. "There was a personal aspect — relationships formed, marriages; people had babies," said David Grinspoon of the Planetary Science Institute in Tucson, Arizona, who worked on Voyager in the 1970s and '80s. "And so there was this really growing sense of a family gathering at each of these encounters in addition to the scientific excitement of the encounter." Legendary musician Chuck Berry performs the hit song "Johnnie B. Goode" during a concert at NASA's Jet Propulsion Laboratory in Pasadena, California, commemorating the Neptune flyby by Voyager 2 on Aug. 25, 1989. In a strange but appropriate coincidence, NASA's New Horizons probe crossed the orbit of Neptune Monday, 25 years to the day after Voyager 2's encounter. New Horizons is speeding toward Pluto, which it will fly by on July 14, 2015. Like Voyager 2, New Horizons will return the first up-close views of exotic and faraway worlds — in this case, the dwarf planet Pluto and its five known moons. "We don't know a thing now, and a year from now we're going to write the textbooks," New Horizons principal investigator Alan Stern said during a news conference Monday. "It's going to be very exciting." Stern referred to the Voyager team as "heroes," noting the influence they have had on space science and on researchers such as himself. "We stand on the shoulders of giants — giants like Ed Stone and his Voyager science team that pioneered how to do the exploration of the deep outer solar system," he said.